Dragon's Breath in Tyler received a letter from police, asking the store to "stop all sales of these products and to remove products from [their] inventory." TYLER, Texas — The Tyler Police Department is asking Dragon's Breath, a smoke shop in Tyler, to stop selling CBD products. In a letter the store received on Friday, the department informed the store of their continued investigation into complaints on the sale of CBD products in the city, and that "any product with any detectable level of THC is illegal to possess in the state of Texas." They gave an example, stating "a product labeled CBD/Hemp Oil 'less than .3% THC' would be illegal if it contained any detectable THC." Their letter also noted that it also serves as a notice to stop selling those products and take them out of their inventory, as they are in violation of the law. 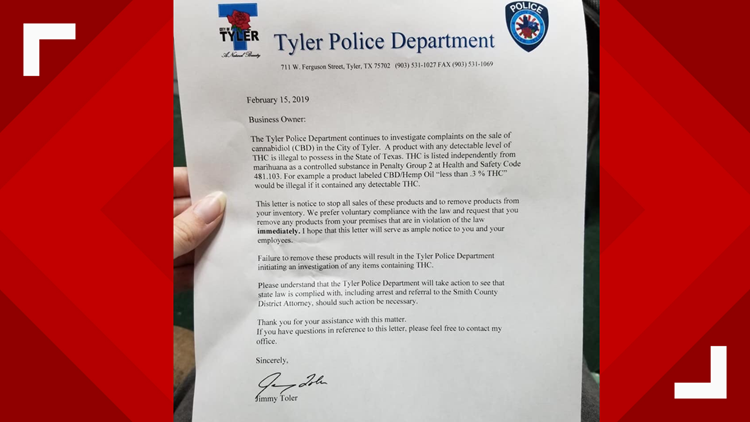 If the store fails to get those products off their store shelves and out of their inventory, the Tyler Police Department will start an investigation "of any items that contain THC."